Honoring our Legacy, Securing our Future Omicron Announces $2.25 Million Campaign W e are pleased to announce the Honoring Our Legacy, Securing Our Future campaign, which will ensure the future of Kappa Alpha Order at the University of Texas. This capital campaign will help us meet the needs of the undergraduates, secure the future of Omicron, and position ourselves to attract top student leaders. Debt reDuction anD cHapter HouSe upgraDeS are neceSSary As alumni, it is vital we contribute time, energy, and our financial resources to Omicron. Your financial gift will be an investment in the lives of our undergraduate members and the future of our chapter. We must also compete with the amenities offered by other fraternity facilities on campus. For Omicron to remain a premier fraternity at the University of Texas, we must pay off outstanding debt and renovate our facility to attract the quality of men we pride ourselves on. Support tHe Future oF omicron The success of our chapter and our alumni is a tribute to the foundation that Omicron instilled in each of us. We urge you to focus on the important task of providing the same experience for future generations of Omicron members. To compete with other fraternities at UT, we must revitalize our chapter house. This will allow our undergraduate men to compete with other fraternities, residence halls, and off-campus living options. We must offer our undergraduates a safe and updated facility. The undergraduates are doing their part to continue building our strong brotherhood with leadership training and guiding the next generation of Kappa Alpha men on their quest for excellence. Now it is time to do our part, as alumni, to secure the future of our fraternity. We urge your thoughtful consideration of this project and what it means for the future of Kappa Alpha at UT. In the next few weeks, please look for more information concerning the capital campaign. The campaign is structured to meet your financial needs and we look forward to your support. Thank you for your loyalty to Omicron Chapter of Kappa Alpha Order. Fraternally, D. Kent Lance '80, Campaign Co-Chairman lance@HPItx.com Jim McBride '80, Campaign Co-Chairman jim.mcbride@bluesage.com OmicrOn Update A PUB L IC A TIO N O F THE UT K A PPA A L PHA HO US ING C O R PO R A TIO N O MIC R O N C HA PTER -THE UNIV ER S ITY O F TEXA S A T A US TIN s WINTER 2018 A s many will recall, in 2011, a dispute arose over the suspension of the Omicron Chapter of the Kappa Alpha Order. The Omicron Chapter relinquished its charter and became a local fraternity. The dispute escalated and a trial ensued in 2013. On the eve of trial, Eric English '78 of Resolution Strategies and Les Allison '73 began efforts to reconcile the two parties and restarted a dialogue with the National Office of the Kappa Alpha Order. After months of intense effort on both sides, a resolution was reached. As a part of the reconciliation efforts, the local fraternity petitioned for and was readmitted to the Kappa Alpha Order. The Omicron Chapter of the Kappa Alpha Order has been a member in good standing and a vital part of the university since completing the reinstatement process in 2015. The lawsuit was settled in 2014. There were a number of alumni who either resigned or were expelled during the course of events leading up to the lawsuit and trial. Their status as members of Kappa Alpha Order was not a part of the settlement, nor was it a consideration for the reinstatement of the chapter. However, in the past few years it has become clear, to both the National Office and to those who know these men who resigned or were expelled, that reconciliation would truly be complete if all who wish to be officially reunited with the Kappa Alpha Order had the opportunity to do so. Housing Corporation Chairman Eric English and Chapter Advisor Jim McBride '80 have worked with the National Office to design a process to complete the reconciliation efforts. Through this specially designed process five alumni have been informed of their acceptance back in the Order and others are in process. The Omicron Chapter has built a remarkably good working relationship with the National Office and has been grateful for the resources National has provided during the past few years. We believe that our relationship with the National Office is a model for all fraternities today. Communication is direct, respectful and responsive on both sides. Reconciliation takes time, but it does happen and we are pleased to inform you that the final chapter is closed. Reconciliation is here. 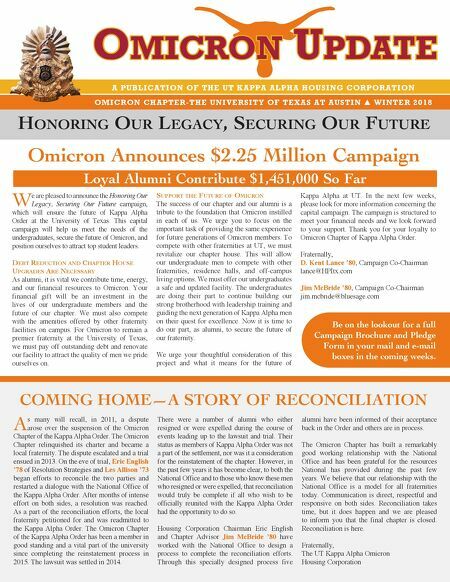 Fraternally, The UT Kappa Alpha Omicron Housing Corporation COMING HOME—A STORY OF RECONCILIATION Loyal Alumni Contribute $1,451,000 So Far Be on the lookout for a full Campaign Brochure and Pledge Form in your mail and e-mail boxes in the coming weeks.